Irene Monat Stern’s luminous and elegant paintings evolved out of her early work in watercolor, a progression evident in the almost liquid flow of colors across her large compositions. In these works, tones melt together and “veils of pigment appear to fold over one another, creating illusory creases and hollows.” (1) The overall affect is one of slow, powerful visual rhythms. Stern’s semi-translucent, gossamer colors billow across her surfaces, soaking into the unprimed canvas to create tactile fusions of paint and support that envelope the viewer in diaphanous veils of paint. Born in 1932 in Poland, Stern survived the Holocaust at a young age, eventually setting in Southern California by way of Paris and New York. 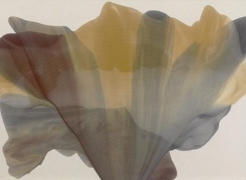 Irene Monat Stern’s work has been exhibited and collected widely, and can currently be found in the collection of the Hirshhorn Museum and Sculpture Garden in Washington, D.C.
For more information about Irene Monat Stern: Air of Twilight, please contact us at info@hollistaggart.com or 212.628.4000.